Parking is a perennial topic of discussion in downtown Charlottesville. The city has repeatedly grappled with the difficulty of balancing the competition for limited parking among shops and restaurants and their customers, commuting workers, residents, students, tourists, government and court personnel, and others. City Council has been wrestling with complaints about downtown parking since the 1930’s. Charlottesville’s trolley (animal drawn in the 1880’s, electrified by 1895) displaced horses, wagons, and carriages—but was itself displaced by the automobile. By 1915 it was clear the greater convenience of the gasoline powered “jitney” would doom the trolley; by 1935 Charlottesville began paving over trolley track, making room for increasing numbers of cars. By 1939 automobile congestion had reached the point that Charlottesville’s Chief of Police attempted to regulate parking by installing a newly invented mechanical device called the parking meter, on Main Street—now the Downtown Mall. “Then as now, Charlottesville’s business owners argued that business suffered when parking spots were taken up by the same car all day.” The original 100 meters were for a ‘trial period only’, five cents for sixty minutes.” The original 100 grew to 1000, and the three month trial extended into the next several decades. City Council held a public hearing to discuss an off street parking ordinance in 1956, but could not hold a debate since no one supported the measure. Council unanimously passed a revised measure later that year exempting Downtown and West Main to Elliewood Avenue. A traffic survey Charlottesville commissioned in 1957 referred to the tension between short term parking needs for shop customers and all-day parking for employees. The survey recommended increasing parking meter rates from five cents per hour to five cents per half hour, and building parking lots and garages for all-day parking. To compete with the convenient free parking at the then new Barracks Road Shopping Center, downtown businessmen pooled their resources in 1959 to form the Charlottesville Parking Center Inc. - a private company supplementing on-street metered spaces by subsidizing free parking for customers in lots and garages. The Daily Progress editorialized in 1993 “increasing parking meter rates, raising parking fines, and stepping up measures to collect fines—are punitive measures that will make the mall less attractive . . .”  The Market Street garage built in 1975, and later the Water Street Parking garage which opened in 1995, were both intended to relieve pressure on free on-street parking. Hoping to strike the proper parking balance, the city has commissioned at least seven parking studies, about one a decade since the 1940's—though more often than not it has ignored the results. Council rejected a parking study recommendation to create a new system of zones in February 2009. City Council also rejected the study's recommendation to consider replacing time limit signs with parking meters. “I think the free parking that we have downtown … creates a better, more inviting atmosphere for visitors downtown,” [then Mayor] Dave Norris said in 2009. 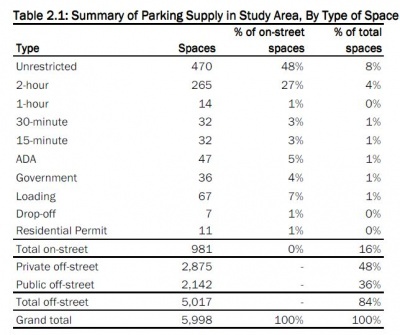 A 2008 parking study found that downtown Charlottesville has about 6,000 parking spaces. 5,000 are off-street and 1,000 are on-street. In 2015 business owner Mark Brown, after buying the Charlottesville Parking Center (two downtown parking garages and part of a parking lot) as well as Charlottesville's Yellow Cab company, advocated eliminating free parking on downtown streets. Mr. Brown initially attempted to remove downtown parking management from city control through a self-taxing "community improvement district," but withdrew the proposal in March 2015 after encountering opposition. At Mr. Brown's instigation in 2014 Charlottesville's Office of Economic Development obtained from City Council funding to update the 2008 consultant's study that recommended metered parking (rejected after a series of public hearings in 2009 and 2010). The resulting 2015 consultant's study, unveiled at an October 1, 2015 work session, recommended installing meters where parking is most in demand, while at the same time keeping some spaces free. City Council has asked for an implementation plan including cost estimates for a new city parking department and so-called "smart meters", and was to hold public hearings on the proposal. The pilot began on September 5, 2017 with a fee of $1.80 an hour in the affected areas with a two-hour maximum. A mixture of single-space and multi-space meters will be used. As part of the plan, the Market Street Parking Garage will offer one hour of free parking and the hourly rate will be reduced from $2.50 to $1.50 an hour. However, the program was suspended during the holidays and will resume on January 2, 2018. On January 2, 2018, City Council voted to suspend the pilot indefinitely, pending re-evaluation one year later. As of March 2019, the program had not been re-evaluated. Web. City Council backs downtown park-and-ride - The Daily Progress: News, Rachana Dixit, February 3, 2009, retrieved October 2, 2015. Web. Off-mall businesses lament parking - The Daily Progress: News, Rachana Dixit, November 10, 2010, retrieved October 2, 2015. Web. City officials: More downtown parking not a priority - The Daily Progress: News, Rachana Dixit, January 12, 2009, retrieved October 2, 2015. Web. Downtown parking: On-street spaces in high demand - The Daily Progress: News, Rachana Dixit, October 30, 2008, retrieved October 2, 2015. Web. Albemarle Supervisors still open to moving courts from Charlottesville, Sean Tubbs, Charlottesville Tomorrow, June 4, 2014, retrieved June 19, 2014. ↑ Web. Study of Traffic Brings Long List of Suggestions, Staff Reports, Daily Progress Digitized Microfilm, Lindsay family, March 2, 1948, retrieved December 10, 2016 from University of Virginia Library. Print. March 2, 1948 page 1. ↑ Web. Study of Traffic Brings Long List of Suggestions, Staff Reports, Daily Progress Digitized Microfilm, Lindsay family, March 3, 1948, retrieved December 11, 2016 from University of Virginia Library. Print. March 3, 1948 page 1. ↑ Web. Uptown Curb Parking Facilities Utilized Under 50 Per Cent Now, Staff Reports, Daily Progress Digitized Microfilm, Lindsay family, March 4, 1948, retrieved December 11, 2016 from University of Virginia Library. Print. March 4, 1948 page 1. ↑ Web. Study of Traffic Brings Long List of Suggestions, Staff Reports, Daily Progress Digitized Microfilm, Lindsay family, March 5, 1948, retrieved December 11, 2016 from University of Virginia Library. Print. March 5, 1948 page 1. ↑ Web. Charlottesville City Council meeting minutes, .pdf, Council Chambers, City of Charlottesville, September 8, 1953. ↑ Web. Charlottesville City Council meeting minutes, .pdf, Council Chambers, City of Charlottesville, November 16, 1953. ↑ Web. Charlottesville City Council meeting minutes, .pdf, Council Chambers, City of Charlottesville, December 7, 1953. ↑ Web. The Lee Park Parking Proposal, Staff Reports, Daily Progress Digitized Microfilm, Lindsay family, retrieved May 23, 2016 from University of Virginia Library. Print. January 23, 1925 page 4. ↑ Web. Metered Lots Preferred - The Daily Progress, staff, retrieved November 4, 2017. ↑ Web. Off-street parking - The Daily Progress, staff, retrieved November 4, 2017. ↑ 18.0 18.1 Harland Bartholemew & Associates, A Report Upon Major Streets, Parking and Transportation, Charlottesville, Virginia, September 23, 1957 (on deposit at Albemarle Historical Society). ↑ Web. For sale: 509 parking spaces - The Daily Progress: Business, Brian McNeill, retrieved October 6, 2015. ↑ Print: Downtown Parking Meters Banished, Ray McGrath, Daily Progress, Worrell Newspaper group September 6, 1978, Page . Harland Bartholemew & Associates, A Report Upon Major Streets, Parking and Transportation, Charlottesville, Virginia, September 23, 1957 (on deposit at Albemarle Historical Society)(refers to an earlier 1947 parking study by the Virginia Department of Transportation; recommended parking garage but City Council balked at the expense). Sherri Nee, Disputed parking proposals stall, Daily Progress October 13, 1993, (Planning Commission rejects study recommending reduction from two hours parking to one, and rejects $15 a month commuter-tag parking; recommends reconstituting parking commission so it represents residents and merchants)(Albemarle Historical Society clippings file). Staff, City’s Parking Plan Draws Sharp Criticism,Daily Progress September 15, 1993 (“residents, employes and business owners blasted a proposed parking plan. . . [reducing 2 hours parking to one, charging commuters, and raising meter rates])(Albemarle Historical Society clippings file). Catherine Wray, City ignores report of its own task force in sale of ‘civic resource,’ Letter-to-the- editor, Daily Progress June 24, 1996 (citing sale of Jefferson Street parking lot to law firm Maguire Woods contrary to 1995 study)(Albemarle Historical Society clippings file). Jake Mooney, Merchants oppose parking restrictions, Daily Progress January 16, 2001 (opposing study recommendations of reducing free parking time from two hours to one; opposing higher fines)(Albemarle Historical Society clippings file). see also 2008 parking study recommendations rejected discussed below. ↑ 24.0 24.1 Web. Council modifies downtown parking; keeps 2 hour spots, Fania Gordon, Charlottesville Tomorrow, retrieved June 19, 2014. ↑ 25.0 25.1 Web. Parking meters worth look-see, say some in city - The Daily Progress: News, Rachana Dixit, May 3, 2009, retrieved October 13, 2015. ↑ 26.0 26.1 Web. Owner of city garages proposing radically new approach for downtown ⋅ Charlottesville Tomorrow, Sean Tubbs, January 18, 2015, retrieved October 1, 2015. ↑ Web. Charlottesville economic development authority might pay for more parking ⋅ Charlottesville Tomorrow, Sean Tubbs, September 8, 2015, retrieved October 2, 2015. ↑ Web. Downtown business association withdraws tax district request ⋅ Charlottesville Tomorrow, Sean Tubbs, March 2, 2015, retrieved October 2, 2015. ↑ 29.0 29.1 Web. 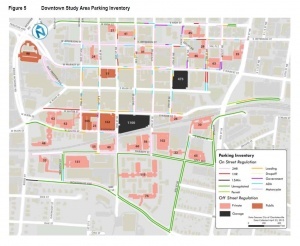 Parking Study Consultant Says Metered Parking a Solution, WVIR staff, October 1, 2015, retrieved October 2, 2015. ↑ Web. Council to discuss downtown parking meters, Sean Tubbs, News Article, Charlottesville Tomorrow, April 4, 2016, retrieved January 2, 2017. ↑ Web. http://www.cvilletomorrow.org/news/article/23433-council-adopts-meters/, Sean Tubbs, April 5, 2016, retrieved January 2, 2017. ↑ Web. Downtown stakeholders learn more about parking meters, Sean Tubbs, News Article, Charlottesville Tomorrow, August 2, 2017, retrieved August 3, 2017. ↑ Web. Parking meter pilot to resume Jan. 2, despite controversy, Sean Tubbs, News Article, Charlottesville Tomorrow, December 22, 2017, retrieved December 27, 2017. ↑ Web. Charlottesville City Council meeting minutes, .pdf, Council Chambers, City of Charlottesville, January 2, 2018. ↑ Web. Press Release: City Ends Parking Meter Pilot Program, City of Charlottesville, January 3, 2018, retrieved 2019-03-20. ↑ Web. Parking plan continues despite removal of meters, Charlottesville Tomorrow, February 8, 2018, retrieved 2019-03-20.